A handbook produced jointly by ODIHR and the Geneva Centre for the Democratic Control of the Armed Forces (DCAF). 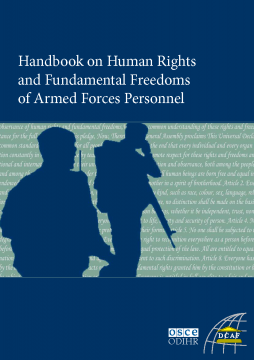 This handbook presents an overview of legislation, policies, and mechanisms for ensuring the protection and enforcement of the human rights and fundamental freedoms of armed forces personnel. It is aimed at all individuals who play a role in promoting, protecting, and enforcing the human rights of armed forces personnel, such as parliamentarians, government officials, policy makers, military personnel, judges, professional military associations, and non-governmental organizations.